Thailand's most celebrated festival is the Songkran Festival. It starts April 13 and lasts between 3 and 10 days, depending on where you are in Thailand. 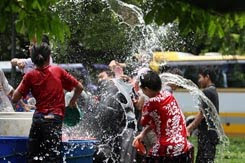 The word Songkran is from the Sanskrit meaning the beginning of a new Solar Year, but nowadays Thailand celebrates the New Year on 31 December. The Thai people celebrate this festival with water. Everyone gets soaking wet and since it is the hottest season of the year, the custom is quite refreshing. Songkran is a Public Spring Cleaning Day, supported by the religious belief that anything old and useless must be thrown away or it will bring bad luck to the owner. During the afternoon of the 13th, Buddha images are bathed as part of the ceremony. Young people pour scented water into the hands of elders and parents as a mark of respect while seeking the blessing of the older people. In ancient days, old people were actually given a bath and clothed in new apparel presented by the young folks as a token of respect for the New Year. Until recently Thailand was almost entirely an agricultural society and this has been a perfect time to take break from the business of earning a living. The rice harvest is in, and replanting has to await the coming of the rains. It is an old belief that the Nagas or mythical serpents brought on rain by spouting water from the seas. The more they spouted, the more rain there would be. So, one might believe that the Songkran customs of throwing water is actually a rain-making idea, but it seems that the Thais don't really bother about way they celebrate Songkran - they just do it for having a great time! We hope you enjoy the pictures we have taken. JOIN IN THE FUN AND BE PREPARED TO GET WET? VERY WET! Sawasdee dee pii mai! (Thai for Happy New Year).